A few weeks after Israelis rallied in support of the Syrian people and against the regime of Bashar Al Assad, first at a rally in Jaffa and then at a candle vigil held in front of the Russian embassy in central Tel Aviv, another rally was held in the northern port city of Haifa. However this time the rally held at El Midan Theater in Haifa was not in support of the Syrian people but of embattled Syrian president Bashar Al Assad. It is reported that at least 500 people from Jerusalem and the Golan Heights attended the event, at which were also present representatives of the of Israeli Arab and Druze communities. The event was planned by the organization “Popular Committee for the Victory of Syria” and was attended among others by Said Nafa, a member of the Knesset for the Arab party Balad, by former Knesset member Issam Mahoul and by the head of the Orthodox church Attalah Hanna. In spite of the daily reports of shelling, bombing and the state of siege in Homs, Mahoul reportedly said to Israeli media that the event was held with the intention to reject the conspiracy hatched against Syria, led by the United States together with Qatar and Saudi Arabia with the sole intention to sow terror in Syria and blame the regime. The argument goes that it is Israel, Arab countries and the United States who are behind the bloodshed in neighboring Syria. Mahoul attacked the Friends of Syria Conference held in Tunisia as enemies of the Syrian people. He also added that while he expressed support for need of reforms in Syria, blamed Israel for being a player in the situation and supporting the bloodshed against the Syrian people. According to another attendee to the event: “The world needs to understand that it cannot be that the Syrian regime will murder its own people, and it is necessary to support Syria until the killings stop.” According to another participant, it is not possible for them to remain silent about the situation in Syria and that the Syrian regime is not responsible for the killing. They also added that there is another state that smuggles weapons into Syria with the only aim to incite people against the regime and killing people; probably blaming the State of Israel, whom they accused of “enjoying the killings”. This might have been the largest rally in support of Assad held by Israeli Arabs since the beginning of the unrest in neighboring Syria, even though similar but smaller rallies have been spotted in the Golan Heights, joined mostly by members of the Druze community. 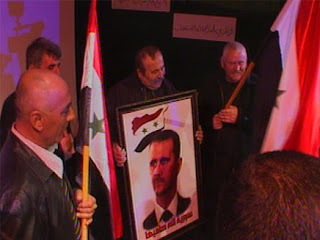 A number of activists also arrived at the event to chant against the Syrian president and causing minor clashes between supporters and opponents of Assad. A similar event took place earlier in the week in Ramallah and there was also a confrontation between supporters and opponents that ended up in a fist-fight. In the meantime, while Arab Israeli politicians deny the extent of the crimes perpetuated by the Syrian regime, pro-Palestine activists have kept silent on the stance of prominent members of the Arab community in Israel. It remains true however that the position of the Druze community in Israel vis-à-vis Syria remains a complex question, as it is that of all the ethnic and religious minorities in Syria, whose fate remains uncertain in the case that the regime will be finally overthrown.